This touristy yet charming town, which gets especially busy during July and August, is an excellent home base for Acadia, the only national park in the northeast. Acadia is known for its beguiling mix of craggy cliffs, crashing ocean waves and towering mountains. Cadillac Mountain, whose profile dominates the area, is the tallest point on the North Atlantic seaboard. A good way to see some of Acadia's greatest hits is to drive the 27-mile–long Loop Road at a leisurely pace (the park service recommends three to four hours). You can enter the park on the eastern side just above serene Sand Beach, where the fine pink powder lining the cove is made up of tiny shell fragments broken up by the relentless surf. (Splash around in the surf if you dare — even during summer, the water hovers around 55 degrees.) 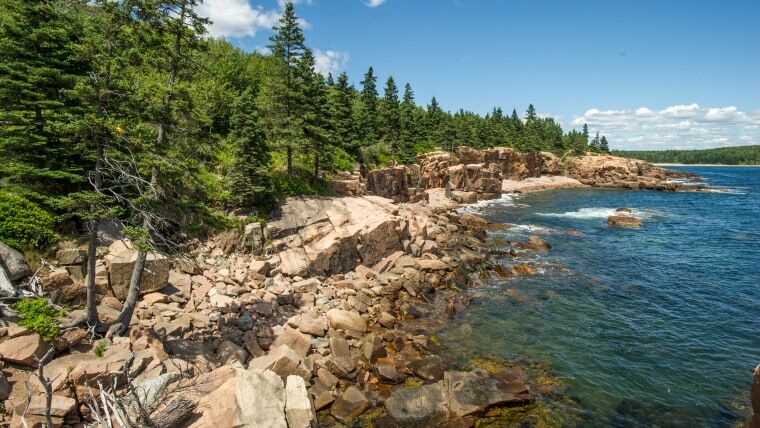 If your kids are game for a hike, from Sand Beach you can take the Ocean Path Trail to the cavern-like inlet known as Thunder Hole, which is named for the incredibly loud sound the waves sometimes make as they roll into it, occasionally shooting water as high as 40 feet into the air. (It's also possible to reach this area by car.) Thunder Hole is a spectacular sight that will thrill both kids and adults, and visiting an hour or two before high tide will give you the best chance of hearing the "boom." Past Thunder Hole is the dramatic rocky headland of Otter Cliff, which is named for the creatures that used to swim nearby, and is one of the park's most photographed areas. Talk about the best of both worlds: Although it was built in 2003, the Bar Harbor Grand Hotel was designed to look like the Rodick House, a popular 19th-century Bar Harbor hotel that was once the largest in Maine. The heated pool and Jacuzzi are delightfully modern upgrades, and the downtown location is unbeatable: It's a short walk to the waterfront and a five-minute drive to Acadia. The rooms at the Hampton Inn Bar Harbor, which is walking distance from downtown and the waterfront, are sunny and spacious. The hotel has an indoor and outdoor pool, and the hilltop setting offers gorgeous views of Frenchman's Bay and the Porcupine Islands. If you'd rather not deal with driving, there's free regular shuttle service around Mount Desert Island between late June and October. Although Jordan Pond House, the only sit-down restaurant inside Acadia National Park, is famous for the beloved homemade popovers served during afternoon tea, those with a serious sweet tooth will want to hold out for the popover sundae topped with bittersweet chocolate sauce. Lunch and dinner options tend towards the classics: Think seafood chowder, Niçoise salad, seared sea scallops and lobster rolls. Many tables overlook the pond and the rounded pair of mountains known as The Bubbles, and the serene setting makes it an incredibly popular lunch spot, especially during the summer.